Following regional trends reflects, how people live, what they wear, eat and grow? The certain phenomenon and activities reflect their tradition and beauty of that specific place. One of the beauty enhancers is the regional jewelry. As we adore our rituals and customs of the locality where we live and spend our life span, as we should be fond of the things gifted by our ancestors and one of these is jewelry. Jewelry is the beauty enhancer for women as she is already that beautiful, but have you ever thought that this beauty enhancer metallic attire does need care and maintenance. Jewelry cleaning is essential to keep its beautiful appearance forever lasting. Jewelry is an intimate and cherished accessory, you must know how to preserve it. Sunlight can damage jewelry as it does damage our skin. Some lavish gems like topaz etc. get a fade in exposure to the sunlight but on the other side, amber gets darken. Pearl and ivory get bleached in the exposure of light. Vintage jewelry should be handled with little extra care and delicacy, you just need to clean it with water or a soft cloth. Uncertainty in temperature change and excessive heat will cause damage in the gemstones. It results in loss of moisture in gemstone and little cracks can be found, pearls get discolor and opals turn brown and breakable. Chemical exposure can damage and discolor your jewelry and may damage precious gemstones, and metals like gold, silver, and platinum. Whenever you apply lotion, perfumes, and hair spray, keep your jewelry away as it contains harmful chemicals which can damage pearl's surface permanently. You must not wear jewelry during swimming as the water is highly chlorinated. Chlorine bleach is a solvent itself to damage gold alloy and ammonia cleansers are too prohibited as it can cause harm to vintage jewelry. Precious colored gemstone require routine care to improve color and quality of the stone. You must know how to handle your gemstone with care. You can clean it with shampoo, mild soap, lukewarm water and a soft brush. You can simply do it at your home. Pearls are more delicate and can easily scratch, use a soft makeup brush, warm water and clean it with a soft towel. Allow it to dry otherwise the thread will absorb dirt. 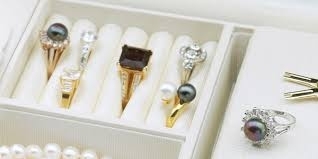 You should store your jewelry in muslin or velvet cloth and keep them in boxes or shelves of your almirah. Such processes will maintain its beauty.